This R10 Custom Rath Trombone comes a standard weight (750) 7½” yellow bell, standard yellow hand slide, standard yellow tuning slide and a number 10 brass leadpipe. 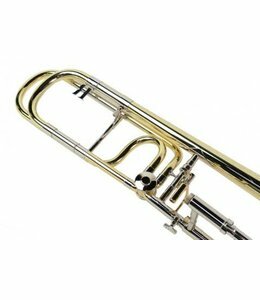 Michael Rath offers an extensive range of tenor trombones to suit your every playing requirement. The six models encompass instruments ideal for every musical genre, from clarity, brilliance and flexibility usually demanded for the lead trombone in a big band, to a dark, full, round tonal quality that you might desire for orchestral performance. Michael Rath tenor trombones provide the perfect solution. The choice of instruments for jazz, commercial, pop or funk style playing is wide, Michael Rath offering 4 different models. Decisions regarding “single” or “dual bore” slides are easily accommodated. The “single bore” choices are the R10 (0.500”) and the popular R2 (0.510”) models whilst the “dual bore” instruments are the R12 (0.481”/0.491”) and R1 (0.500”/0.510”). The standard bell size for these instruments is 7½”. If you tend to be more focused on brass band, wind band or orchestral playing then the two largest bore models, R3 (0.525”) or R4 (0.547), having bell sizes of 8” and 8 1/2” respectively, make an ideal choice. As with all Rath Custom Trombones the instruments can be tailored to meet your particular preference. This can include bell size, tuning slide material, finish etc. Options can be found at the bottom of this page. Significant is the introduction of an “in slide” tuning system for tenor trombones similar to that on the R11 alto trombone. This has advantages of tuning and timbre with little penalty in terms of slide weight.